TruckParts.trade - How does it work? 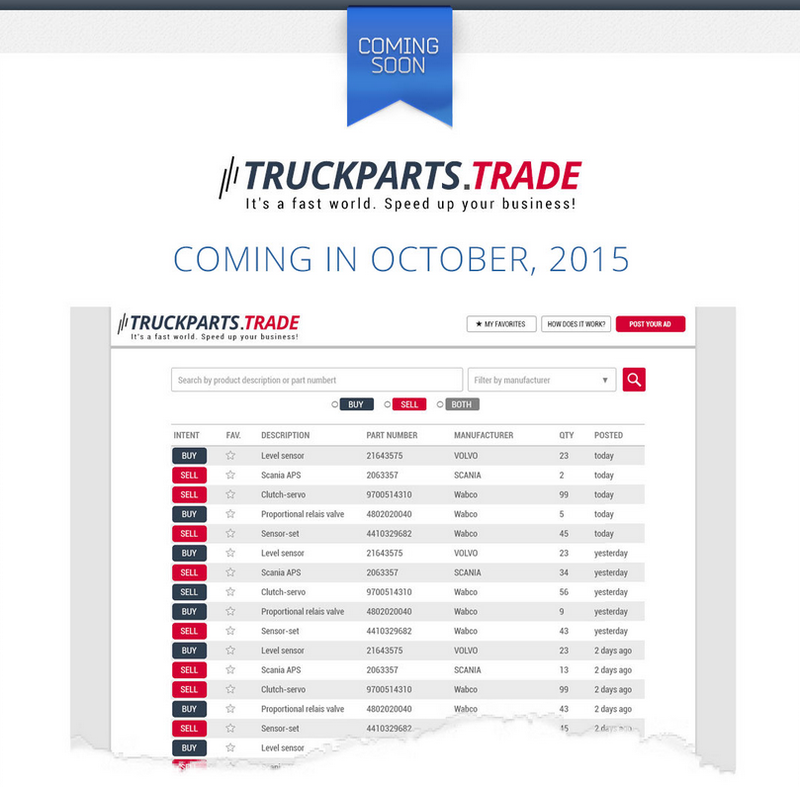 TruckParts.trade is abusiness platform for truck and bus spare part specialists from all over the world. The concept has been simple, from the very beginning: create a marketplace where professionals canBUY andSELL spare parts. But it just wasn’t enough for us. Throughout the process we had one crystal clear aim in our mind: We wanted to build the best of such sites and nothing less. What do we mean by the best? No registration, fees, contracts, username or password. We wanted to keep it simple. Only OE and OEM parts, no copy product “clutter” from China, India, Turkey, etc. 30 seconds to post a new ad (if the user is a slow one). Customer Service Done Right: an actual human being answers the phone. I DON’T KNOW... I’M NOT TOO FAMILIAR WITH SUCH ONLINE STUFF. If it’s the case, probably this is one of the best sites to start with. It’s clean, simple and intuitive. If you can use gmail or outlook, you will handle this one as well. No username or password required, yet secure. WHAT BENEFITS WOULD I GAIN FROM THIS? First of all it’s for free. Forever. Just think about, how many partners can you contact with your inquiries by e-mail? Couple dozen at max, right? How about if 9672 users would see your posted ad?Quite different dimension, isn’t it? Let’s face the fact: very few are interested in your e-mail special offers, Excel sheets, if at all. Address the right people with the right items in the right moment. Everything else is annoying and unprofessional. You know such people too, don’t you? Sell your slow-mover and dead stock. Source the best conditions for your purchasing. Start receiving no-obligation offers virtually in minutes. Stay incognito, don’t let everyone know that you are selling a specific item at a specific price. After all, confidentiality is important in our business. Don’t lose money with unverified, risky suppliers. Let us arrange payments, deliveries. Last but not least: save time! HOW COULD I BULK UPLOAD MULTIPLE ITEMS? Send us the list in Excel and we will upload it for you. So simple. If any questions, our customer service will contact you by e-mail. Once it’s online we will notify you by e-mail. WHAT PRODUCTS COULD I FIND ON THIS MARKETPLACE? For clarity reasons only OE and OEM brands allowed, no copy or aftermarket products (see the list below). I CAN’T FIND A SPECIFIC MANUFACTURER IN THE LIST. WHAT SHOULD I DO? Contact us and let us know.Our team will take care about this. WHY IS THERE NO PRICES SHOWN? We buy from the seller and sell to the buyer. It is impossible to auto-calculate prices, as it depends from many different factors (geographical location and quantity in the first line). The only way to offer best possible prices is to calculate prices on a case-by-case basis. Our pricing team has many years of experience. Let us do it for you as well. WHAT HAPPENS WHEN SOMEONE IS INTERESTED IN MY OFFER? We let them know the price. Once we have received an order, we will contact you. WHAT HAPPENS WHEN SOMEONE SENDS AN OFFER TO MY REQUEST? Our team calculates your price and notifies you by e-mail. As time passes by, you may receive multiple offers. You may simply unsubscribe if you’re not interested anymore. HOW LONG ARE ADS ONLINE? Both BUY and SELL ads are online for 30 days. After that you will receive a notification e-mail. You decide if you want to delete your ad or extend for further 30 days. Reason for that, we want to maintain a clean and fresh database. I’M FROM CHINA / INDIA. WHY CAN'T I POST ON YOUR SITE? This site is dedicated for OE and OEM parts only. Our mission is keep maximum level of consistency in this respect. Therefore we have decided to ban certain users to stop spamming. Same ban will be actually in action against anyone from any region who keeps spamming or entering non-genuine items despite our notice. Contact us if need help. SOME PRODUCT DESCRIPTIONS AND PART NUMBERS ARE ALREADY PRE-FILLED, SOME ARE NOT. WHY IS THAT? Certain manufacturer’s price lists are public, while others are so-to-say “less public”. We are continuously updating our product database to make your work your work easier. Currently more than 1.8 million part numbers and accompanying english descriptions are already uploaded. That means when you start typing you'll notice the handy auto-complete feature. You may contribute to this by sending us missing price lists. ANY WAY TO SUBSCRIBE TO E-MAIL NOTIFICATIONS? You can easily subscribe to any desired product, product group, manufacturer (or combination of these) and receive e-mail notifications if a new BUY or SELL ad is posted online. The choice is yours.